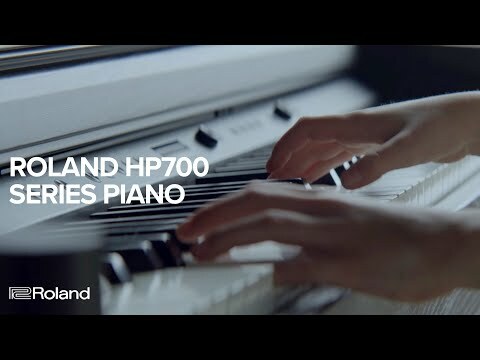 The flagship piano of the new Roland HP700 Series, the HP704 features the elegant PHA-50 Hammer-Action Keybed, SuperNATURAL sounds and an up.. The flagship piano of the new Roland HP700 Series, the HP704 features the elegant PHA-50 Hammer-Action Keybed, SuperNATURAL sounds and an upgraded 4-way Acoustic Audio projection system. The HP704 ultimate home piano for those that treasure the highest sound quality to fill your room, with sleek styling to match. Playing the piano is one of life’s most rewarding experiences, whether teaching yourself or watching your family discover a passion for music. Roland’s all-new HP700 series supports your ambitions with gorgeous piano sound, sophisticated styling, and helpful features that’ll keep you playing. And with the flexibility and expression to suit any genre or playing standard, you’ll have a Piano that grows with you as you master your craft. The Roland HP-704 piano can be the centerpiece of a room - or so discreet you hardly know it’s there. For silent practice day or night, connect headphones and enjoy immersive sound that won’t disturb your family or neighbors. For interactive study, wirelessly connect the Roland HP-704 with your smartphone via Bluetooth and play along with your favorite tunes, or sharpen your skills with online tutorials. As you play, your performance comes to life through an advanced four-speaker Acoustic Projection System that delivers sparkling highs, warm lows, and everything in-between. The four speakers are configured as two pairs inside the instrument, and each pair is optimized to deliver superior sound reproduction across the piano’s vast dynamic range. Whether you’re playing or streaming music, you’ll hear every note in immersive, crystal-clear sound. Piano Every Day is a free iOS/Android smartphone app that encourages you to play more often. Browse and purchase from Sheet Music Direct’s online library of over 70,000 music scores. Try the One Week Master option to track and display your progress as you learn a new piece, complete with exercises if required. If you love the piano, learn something new and play more often with Piano Every Day. The Roland HP700 Series Pianos are also compatible with Roland's Piano Designer App, helping you get the most from your new Digital Piano. With the Piano Designer app, you can easily control many elements from the graphical touchscreen on your mobile device. In addition, the app includes many ready-to-play settings, allowing you to enjoy custom sounds created by world-class piano technicians.